Welcome! I currently work as a Special Scientist (Temporary Teaching Staff) in Linguistics at the English Department at the University of Cyprus, where I do research on morphosyntax and multilingualism and teach courses on Theoretical and Applied Linguistics. 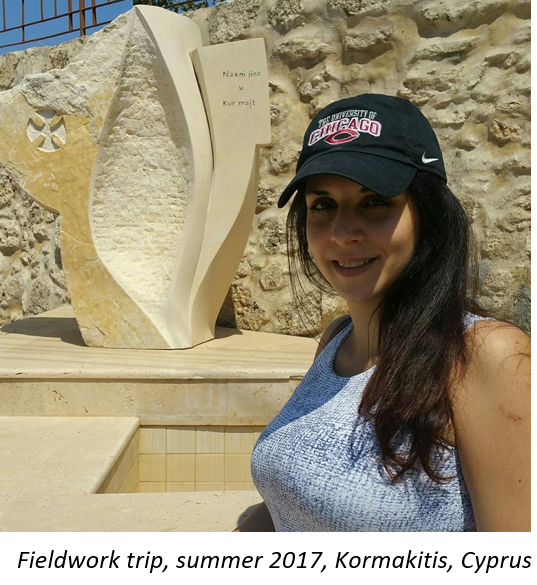 I also coordinate ongoing activities at the Cyprus Acquisition Team lab (Director: Kleanthes K. Grohmann, more here: https://research.biolinguistics.eu/CAT/) , such as regular meetings, talks and ongoing research activities. If you are interested in giving a talk at the lab, contact me at nataliapavlou@gmail.com. I have completed my Ph.D. in Linguistics at the Department of Linguistics at the University of Chicago (thesis advisor: Prof. Jason Merchant). I am interested in syntax and morphology and their interface and a major goal of my research is to understand the structure of sentences and words. My main empirical focus is on the syntax and morphology of Cypriot Greek and Standard Modern Greek. Beyond my current focus on theoretical linguistics, I have worked on experimental projects investigating adult speech and children’s speech development in diglossic contexts. This work investigates the patterns of exposure in both a standard language and a dialect and its consequences with respect to the development of grammar and the sociolinguistic aspects of it. I have also conducted fieldwork on the endangered minority language of Cypriot Maronite Arabic (Sanna). I have been investigating code-mixing and allomorphy in nouns and its implications for morphosyntactic theory and I am more generally interested in the variation between different generations of this community.